Reports from overclocking community HWBOT suggest that Windows 8 reports inaccurate stats when a PC running the OS is overclocked. Hardware based real time clocks (RTCs) are performed to test the speed of hardware. The idea is that the tests provide accurate and real time statistics, rather than something in software which can be fiddled with. However, it seems that the OS can also fiddle with the statistics when the CPU base clock frequency is amended from within the OS. When underclocked by six percent, the Intel Haswell test platform used by HWBOT lagged 18 seconds behind the actual time – tricking the benchmark into a higher score because it appeared to finish faster. 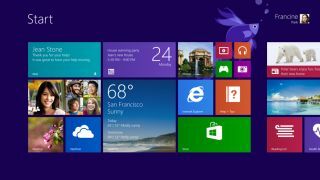 The reason for the inaccurate results is because Windows 8 has to be compatible with a number of different devices, with different configurations of hardware, some of which don't have built-in RTC hardware. In an editorial HWBOT said: "Microsoft made changes to how it measures time to be compatible with embedded or low cost PCs that do not have a fixed RTC clock. After all, having a fixed RTC clock adds cost to a platform." Check out our Hands on: Windows 8.1 review for our thoughts on the latest version of the OS.